I was very lucky to obtain my bottle of Camille BRAUN Auxerrois Cuvée Marguerite-Anne 2013. It seems the only US merchant for this bottle is my local wine shop, The Corkscrew. I’m still learning about this varietal, and in fact I remain a touch mystified. I’m not too proud to admit that I did some hunting on this grape and the internet (god bless it) didn’t offer reliable consistency. So I’ll hand off a quote from my go-to friend, The World Atlas of Wine from Johnson and Robinson. The experts indicate that Auxerrois is generally blended with Pinot Blanc; of the two Auxerrios is softer. Klevner is a varietal grown in the Alsace; found in limestone, and drinks “lightly spicy, sometimes buttery” (again, The Atlas of Wine). My current impression (as I continue my reading and tasting research) is that I have much to learn and perhaps a trip to Alsace is in order. Who’s in? Alsace is the sort of place I envisioned, as a child, to embody the setting of a perfect European vacation. In the North East corner of France, Alsace threads along the Rhine river. The Route des Vins d’Alsace leads wine lovers through over 100 villages frosted with charming timber homes and buildings. The Vosges Mountains create an additional layer of appeal: beautiful, rolling, natural. Cobblestones, flowers, estates, history (a load of history) are all part of the Alsace experience. The Guild of Sommeliers offers this lovely video, which pleasantly covers the need-to-know spectrum of Alsace in terms of region, history, nature and of course: wine. I was a bit taken by the fact that this bottle was, in several ways, exotic to me. Exotic, but destined to be my bottle for this event. That so little has been imported, and the bit that is in the États-Unis rests on the shelves of my shop (a place I have a solid relationship with through business and friendship) made the wine world seem suddenly small. That this particular and elusive grape flourishes in that small swath of Alsace means I’m getting a singular manifestation of this rare and delicious bottle. It also got my curiosity flowing and because of that, I feel we’ve started a relationship, Auxerrois and I. This romantic synchronicity is actually one of my favorite experiences as a wine lover. That a winemaker steps onto the soil, breathes the air, touches the vines and thinks: I’m going to wrap all of this up and make wine. In homes, hotels, restaurants and bars across the world, a person chooses that particular bottle and takes a drink. At that moment, the whole of everything that the winemaker put into the bottle mixes with the whole of what the drinker experiences…and there is something new, something they created together. This something can result in anything: it turns friends into lovers, and lovers into couples with a 50-year story. It turns cold nights into warm cuddles and long days into relaxing evenings. It turns 5,000 miles into an overnight flight where a woman from Illinois can meet with a winemaker from Alscase after a morning cup of café. I am historically familiar with the Alsace region, primarily through books I’ve read about the area, a place that has changed hands between Germany and France many times. 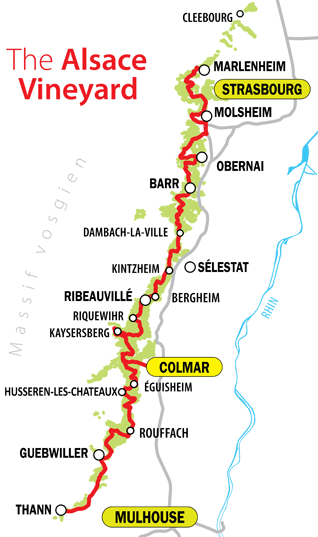 The area is known to be (if not a blend) a meeting of French and German cultures and this impact flows through the regional wine in particular. 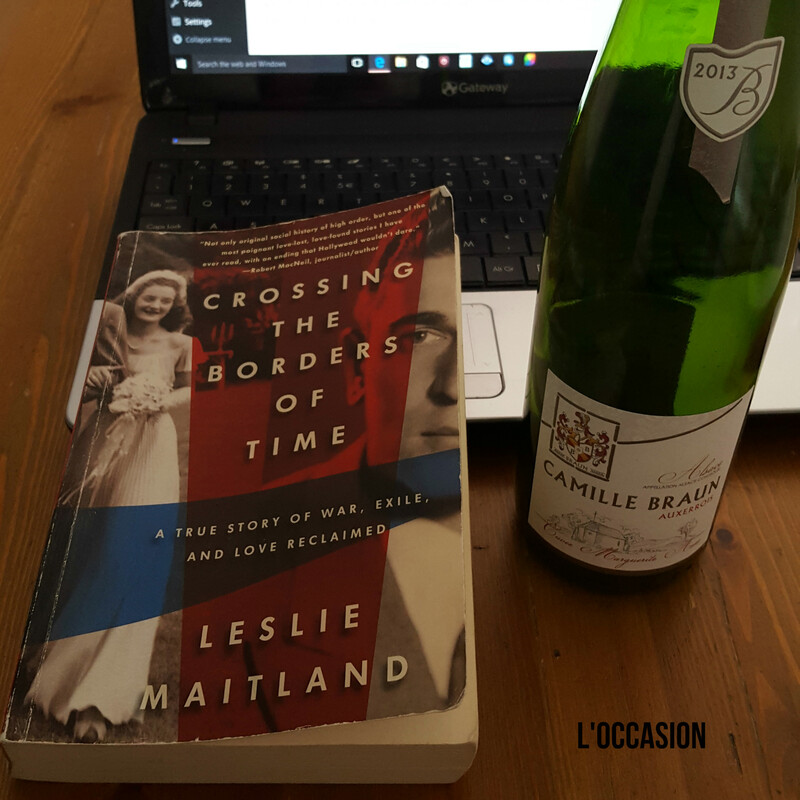 Another touch of intimacy was revealed when I considered a book I’d recently read, Crossing the Borders of Time by Leslie Maitland. Ms. Maitland captures the story of her mother’s family, from Freiburg, Germany. Her mother, Janine, was a German Jew who was forced to leave her European homeland to resettle in the United States, via Cuba, in the early 1940’s. Janine’s journey is phased in several long-term stops throughout France, beginning with Mulhouse and Colmar, villages that skirt the edge of the Alsace AOP where Domaine Camille BRAUN makes wine. I got certain impressions of gaps closing, connections made, time shifting and maybe most of all and impression of: Hey, I know you! And though I don’t know the folks at Camille BRAUN and I don’t know the family of Leslie Maitland I am able to feel that perhaps I do, in some ways, share a thread with them. The book and the bottle are here with me as I’m typing this story. It is windy and unseasonably warm. My kids are at school and I’m looking forward to an evening with my husband. 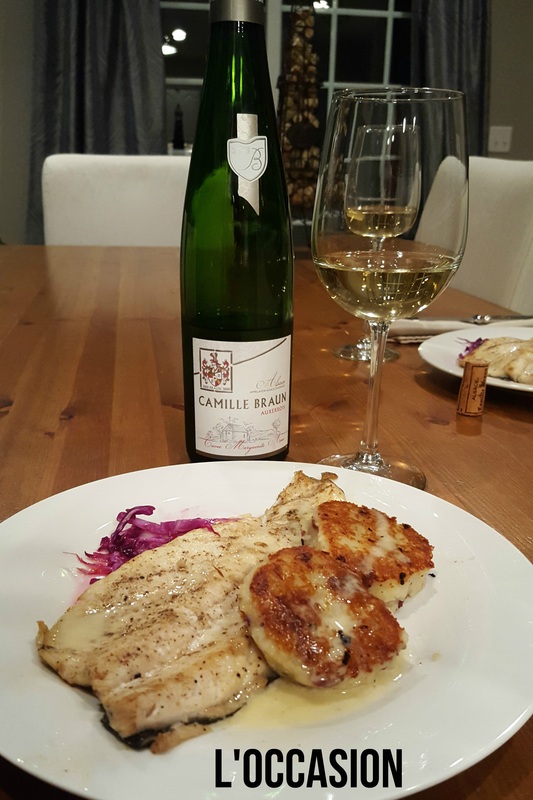 I’m a writer in a Midwestern kitchen, Domaine Camille BRAUN are winemakers in Alsace, Leslie Maitland (according to her book jacket) is a journalist in Maryland…but because of that bottle of wine we are all about to have dinner together. My talented and intuitive husband, a gem in the kitchen, prepared the dinner partner for our wine. Two fresh filets of rainbow trout, a side of seasoned red cabbage (the most gorgeous thing ever to meet a knife in our kitchen) and delightful little cake of potatoes, sautéed onions and herbs. The simply seasoned fish went on the grill (it was incredibly warm for February) and the potatoes, after a boil bath, were sautéed in olive oil. The cabbage was honeyed and lemoned…C’est tout. Salt and pepper, as needed. If you’d like a bottle for yourself, you can order online from The Corkscrew’s website: http://www.thecorkscrew.com. If you’d like a copy of Crossing the Borders of time, you’ll find it on Amazon, here (check out the prices on used copies). Grab your corkscrew! The French Winophiles are touring Alsace, France! Join us Saturday, February 18th for a live Twitter Chat at 8 am PST/11 am EST using #Winophiles. Great post Jill! 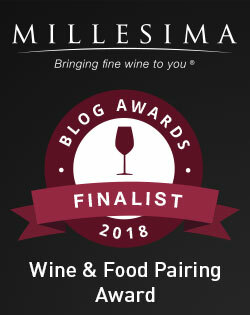 I love the deep dive into the region, your comments about the grape variety, and how you made it personal too! Looks like a great pairing as well! Thanks! This was so interesting, still reading & exploring. Followed up with more of the wine too — without food. Still fantastic! Guess who’s coming to dinner?! Me. Love this, wish to be sipping and researching with you now. And we just got a special case of côtes du rhône to share with guests so get over here! What a find, Jill! Very cool. 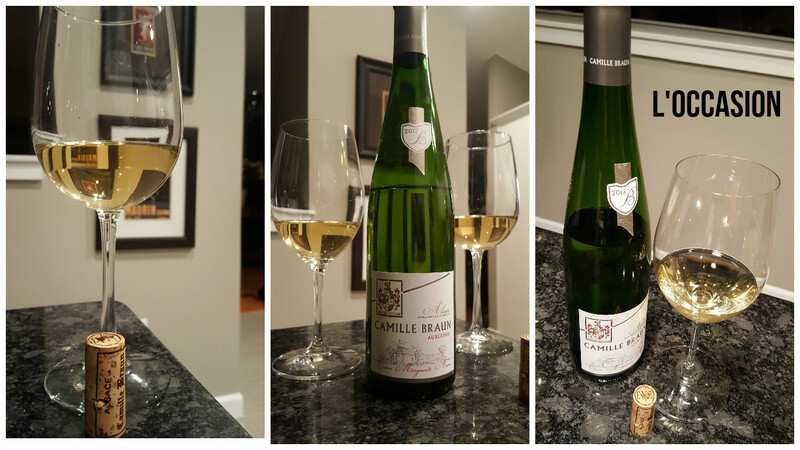 Thanks for great wineophiles “conversation” on Alsace today! I’m in for a trip to the Alsace! The wine sounds delicious and the meal looks outstanding! Such delicious food & wine from Alsace! Thank you! Oooh, I’ll have to see if I can get a bottle. Thanks for the tip! Wow, it is hard enough to find Auxerrois in France! Well done! It was a gem! We’ve had such fun learning, tasting & pairing! What a great meal, and a great wine story too! Thanks for sharing. Makes me curious to visit Alsace too. Any idea what locals would pair with the wine? Not sure if trout is common there or not. Thank you! I have seen a couple of local trout recipes come up, but we didn’t exactly stick to regional-style preparation. 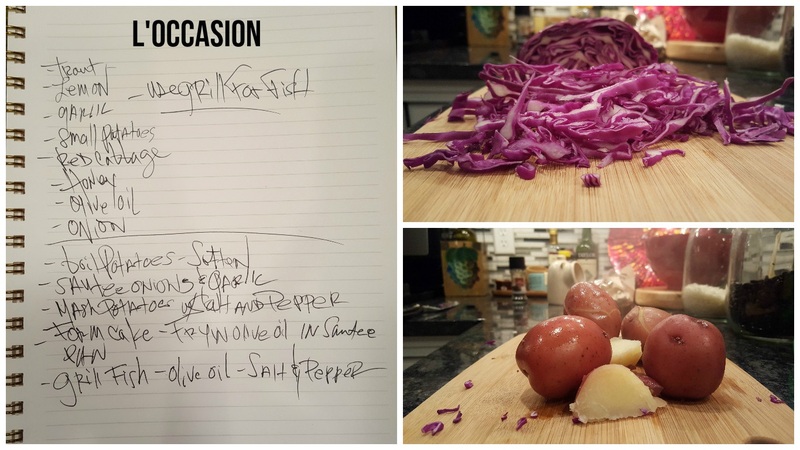 The potatoes with onions were also based on regional ingredients but prepped imaginatively. 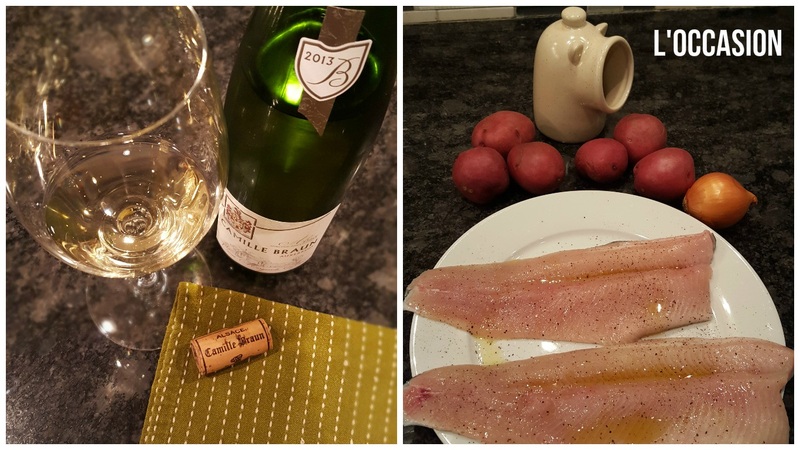 With this somewhat ‘rare’ varietal, I didn’t find much on recommended pairings, but the Alsatian blanc wines in general have a lot of kitchen capacity. The chart identifies seafood pairing options, are the site has pairings for all sorts of food. And…now I’m hungry!